Why Hire a Single Realtor in Utah When You Can Hire a Team? One of the biggest complaints with hiring a Realtor is not being able to get him/her on the phone. Another complaint is that once you hire a Realtor, he/she delegates the job to a less experienced assistant. Hire a team of Utah County Realtors to sell your home. Working with Team Teasdale Realty will gain you the benefit of an entire Utah County real estate team vs. a single Realtor. Since our entire team never takes a vacation or time off, you’ll be able to reach someone whenever you need us. Our “Team” has specialists who work on every aspect of the home buying and selling process—everything from advertising to closing, and then even after. There is no need for a "Jack-of-all-trades, master of none." Each member of our team is a master of his/her own specialty. What is the Difference Between a Real Estate "Team" and a Real Estate Agent? A single agent typically is a salesperson. They own their job. They market and sell a house and then market again and sell another house. They are one person wearing many hats. It is a difficult job to do well by yourself. Imagine your physician or your dentist working alone. It would be difficult for them to answer the phones, run the tests, do the x-rays, handle the billing, see the patients, perform the surgery, book the appointments, follow-up, etc. You get the point. A real estate team like Team Teasdale Realty is a group of professionals...a business. Everyone is trained to perform his or her individual expertise as it is applies to your real estate transaction. Team Teasdale Realty has a Principal Broker, Associate Broker, Short Sale Specialist and Operations Manager and three Buyer Specialists. We "team up" to make sure you have a very smooth transaction while getting the best price and terms possible in the market. For your next real estate transaction, don't limit yourself - hire a team... Team Teasdale Realty! 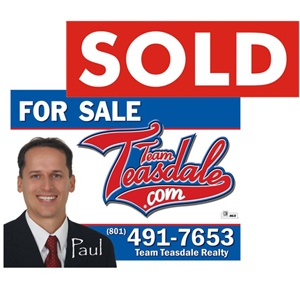 Paul Teasdale has been selling homes in Utah County prior to graduating from BYU in 1995. Paul has personally sold over 1,100 homes in Utah County. Utah County has 1,500 Realtors. Less than 20 agents have sold more than 1,000 homes. Put Paul's experience in your corner when negotiating to buy or sell a home in Utah County. As Paul's Real Estate business has grown over the past two decades so has his team. Paul's team is very efficient and anxious to help you with your real estate needs. Hire an entire team of Realtors to help you buy or sell a home in Utah County.